FDA medical oncologists discuss the Sept 14, 2017, approval of MVASI, the first biosimilar approved in the US for the treatment of cancer. Sanjeeve Bala: Welcome back to the DISCO. 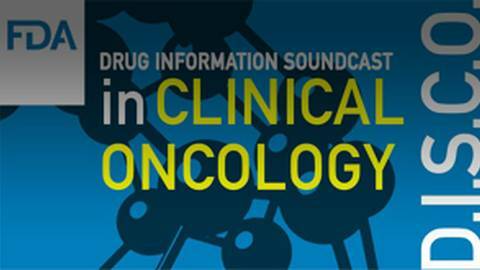 Today’s Drug Information Soundcast in Clinical Oncology from FDA’s Oncology Center of Excellence discusses the recent approval of bevacizumab-awwb, a biosimilar to US-licensed Avastin, marketed as MVASI. Abhilasha Nair: Biological products, or biologics for short, are usually made through biotechnology in a living system such as a microorganism, plant cell, or animal cell. Examples of these include vaccines, blood products, human cells and tissues for transplantation, and others, like therapeutic proteins and antibodies. Hi, I’m Abhilasha Nair, an oncologist at the FDA. SB: And I am Sanjeeve Bala, also an oncologist at FDA. In prior episodes of the DISCO, we discussed an abbreviated approval pathway for some drugs based in part on prior FDA approval of a reference drug with the same chemical entity. In a similar way, in 2009, the Biologics Price Competition and Innovation Act, or BPCI Act, created an abbreviated approval pathway for biologics shown to be “biosimilar” to or interchangeable with an already FDA-approved biological product, known as the reference product. AN: Today in the DISCO we’ll discuss a regulatory landmark: the first US approval of a biosimilar for the treatment of patients with cancer. SB: Abhi, this abbreviated licensure pathway allows companies to rely on FDA’s previous finding of the safety and effectiveness of the reference product, based on a demonstration of biosimilarity of their proposed biosimilar to the reference product. Because we are discussing specific commercial products, we’ll refer to the reference product by its trade name, which in this case is US-licensed Avastin, and to the biosimilar product by its trade name, MVASI. The BPCI Act permits approval of a product shown to be biosimilar to a reference product, such as Avastin, based on different analytical and clinical data than would be required for a brand-new drug, called a new molecular entity or NME in regulatory-speak. AN: Sanjeeve, let’s get further into this. But without too much of the regulatory jargon, can you tell us a bit more about this approval pathway? SB: Sure, Abhi. It’s easier if we talk about this application with the understanding that conceptually, the approach to the development of MVASI is generalizable to other biosimilar development programs for therapeutic antibodies. Approval as a biosimilar means, in part, that the product has fulfilled criteria that support two standards. First, MVASI must be “highly similar” to the reference product, Avastin. Second, MVASI must have “no clinically meaningful differences” from Avastin. SB: Agree. First, to demonstrate that MVASI is “highly similar” to Avastin, extensive structural and functional characterization is performed on both MVASI and Avastin. In this process, the two drugs are compared to look for differences in several attributes, including purity, structure, and function, among several others. AN: And if, after this characterization, there are residual uncertainties about whether the proposed biosimilar is highly similar, then what? SB: Well, minor differences in clinically inactive components are acceptable, such as different buffers. Other minor differences may be acceptable if they do not affect the clinical performance of the product. But if a proposed biosimilar doesn’t meet the “highly similar” standard, it cannot be approved as a biosimilar product. AN: OK, and the “no clinically meaningful differences” standard is addressed with data that demonstrate that there are no differences in safety, purity, and potency, or, using FDA regulatory terminology we’ve been using in the DISCO, no differences in safety and effectiveness. For MVASI, the applicant submitted comparative human pharmacokinetic data, as well as comparative clinical safety and effectiveness, and immunogenicity data. These data were found to adequately demonstrate no clinically meaningful differences between Avastin and MVASI. SB: That sums it up. The evidence required for biosimilarity is often depicted as a pyramid, with the most support coming from the extensive analytical studies as the foundation, and clinical pharmacology, immunogenicity, safety, and efficacy studies, adding to the totality of the data on top of that foundation. AN: Sanjeeve, I noticed that MVASI is approved for many of the same indications that Avastin is approved for, but the applicant only conducted a clinical study in patients with non-small cell lung cancer. Tell us why they didn’t have to conduct clinical trials for each of the cancer indications that MVASI was approved for. SB: Unlike for a stand-alone development program, the standard for approval doesn’t require the applicant to perform an independent demonstration of efficacy and safety in each clinical indication to support approval for each indication of a biosimilar. A biosimilar can be approved for other indications of the reference product without direct clinical data in the indication because of a concept known as extrapolation. AN: This is another important aspect of this abbreviated approval pathway. Tell us about extrapolation for biosimilars. SB: Extrapolation means that if biosimilarity is shown in one indication, the applicant can scientifically justify approval for the other indications. This justification is based on the totality of data, and information in the application, and specifically addresses factors such as mechanism of action, to support that extrapolation is warranted. AN: What kind of data formed the basis of this biosimilar approval? SB: It’s important to remember that therapeutic antibodies are generally produced by genetically engineered cells in tissue culture, and not synthesized in a chemistry lab. The applicant submitted data demonstrating that MVASI can be manufactured in a well-controlled and consistent manner and is highly similar to US-licensed Avastin. They also submitted clinical pharmacology data that demonstrate the pharmacokinetic or PK similarity of MVASI and US-licensed Avastin. However, MVASI has not been established as interchangeable with Avastin. We’ll discuss the interchangeability of biosimilars in another DISCO discussion of abbreviated approval pathways. AN: Good idea. Tell us about the clinical data the applicant submitted. SB: The applicant submitted data from two clinical studies. The first was a PK similarity study in healthy subjects, considered to be a critical assessment for clinical differences, which demonstrated similar PK profiles for the two products. The second study was Study 265, a randomized, double-blind, study in 642 patients with advanced non-small cell lung cancer. Patients in both study arms were treated with platinum-based chemotherapy. Patients were randomized (1:1) to receive MVASI or the bevacizumab product approved in Europe, at a standard dose. The primary endpoint was overall response rate assessed by independent radiology review. In addition, the applicant showed that immunogenicity was similar for patients treated with both products. AN: Sanjeeve, is MVASI approved for all the indications that Avastin is being used per the FDA-approved label? SB: No Abhi. Two indications where Avastin has been approved in combination for the treatment of ovarian cancer are covered by something called “orphan exclusivity.” Because of this exclusivity, the applicant cannot seek approval for these indications for a specified time period. We can get into that in another episode of the DISCO. AN: Alright. What about the safety of MVASI? Sanjeeve, is the safety similar to Avastin? SB: Like Avastin, the labeling for MVASI contains a Boxed Warning about an increased risk of gastrointestinal perforations, surgery and wound healing complications, and severe or fatal hemorrhage. For prescribers familiar with Avastin, and pretty much anybody in oncology given the number of indications Avastin has, this abbreviated list will be familiar, though detailed information is in the prescribing information available on the web at Drugs@FDA. Similar to Avastin, common expected side effects of MVASI include hypertension, proteinuria, and hemorrhage. Rare but serious side effects include perforation or fistula, thromboembolic events, and ovarian failure. AN: Thanks, Sanjeeve. Give us the three take-home points from this DISCO. SB: First, the MVASI approval represents the first biosimilar approval in the US for the treatment of patients with cancer. Second, MVASI is approved for all the same indications that Avastin was approved for, except the ovarian cancer indications. Third, the safety profile of MVASI appears the same as US-licensed Avastin. Detailed prescribing and safety information may be found in the prescribing information available on the web at Drugs@FDA. SB: For a transcript with links to an in-depth look at the FDA analysis, and the multidisciplinary team of FDA experts who conducted the review, visit the FDA Oncology Center of Excellence DISCO website at fda.gov/DISCO. For more information on biosimilars, including information on the scientific approach FDA has put in place, visit FDA’s Biosimilars website at www.fda.gov/biosimilars. AN: Would you like to hear more about the biosimilar approval pathway? Leave us your questions and comments on Twitter @FDAOncology . I’m Abhi Nair, and thank you for tuning in. Oncologists Dr. Sanjeeve Bala and Dr. Abhilasha Nair from FDA’s Oncology Center of Excellence discuss the recent approval of bevacizumab-awwb, a biosimilar to US-licensed Avastin, marketed as MVASI. MVASI is the first biosimilar approved in the US for the treatment of cancer.